Director: Bradley Cooper. Cast: Bradley Cooper, Lady Gaga, Sam Elliott, Ravi Gavron, Andrew Dice Clay, Anthony Ramos, Shangela Pierce, William Belli, Dave Chappelle, Lukas Nelson, Michael Harney, Alec Baldwin, Eddie Griffin, Halsey. Screenplay: Eric Roth and Bradley Cooper & Will Fetters (based to varying degrees on the 1954 and 1976 screen versions of A Star Is Born and the uncredited 1937 screen story by William Wellman and Robert Carson). Twitter Capsule: Savory artpop. Takes trouble to complicate rise/fall dichotomy. Solid to strong across the board. Cooper's perfect. VOR: ③ I can't claim massive originality and risk, but it nudges the story in interesting ways. A strong seminar in creative commitment to borrowed material. 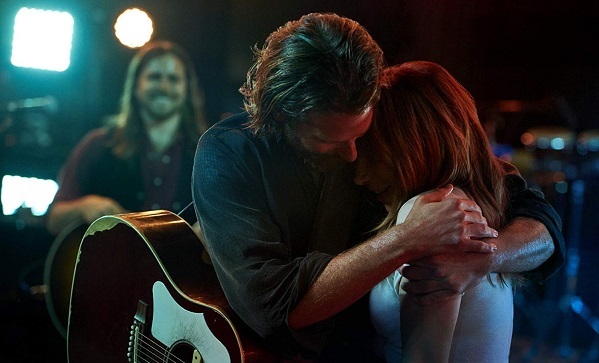 ★ Best Original Song: "Shallow"